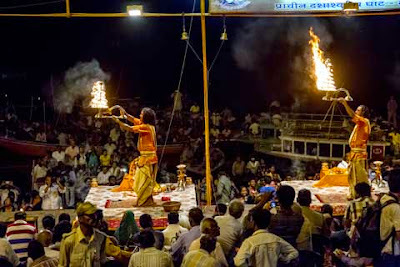 For night shooting, such as the Ganga Aarti Fire Festival on the banks of the Ganges River in Varanasi, India, a lightweight tripod or other camera support is very helpful. Photos by Joel Simpson. HEADS UP: Welcome to the fold new contributor Joel Simpson, a Renaissance man and generally worldly fellow. (Read his profile on the “About VP/[Contributors tab,” http://www.bit.ly/1tzS8VW]) Indeed, he recently returned from a trip to a dozen countries. 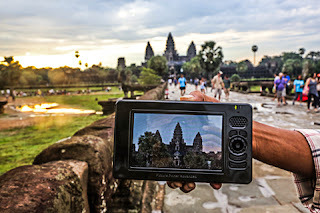 Not only does Joel have breathtaking images to share, which will be published shortly, he returns with some very useful pointers for traveling in the developing world detailed here last week, yesterday and concluding today. Take heed, Dear Travelers. YOU may be gone far, far away. But you need not be forgotten. Having returned from a 10-week jaunt around the world, I was compelled to share with others how they could do it, too, with the least amount of hassle and hustle. Over the last two weeks I have offered suggestions about important arrangements such as packing, incidentals, transportation and lodging. Finally, some words about communications and photography. After all, you'll want to share your amazing experiences. So much of the joy of travel is in sharing it with friends and family – most of whom stayed home. We used to send postcards, but in the digital age we can practically carry our loved ones h us. Most people send photos they take with their smartphones right away. If you maintain a trip blog, however, you can communicate with many more people and offer more information. When it’s all over you’ll have a field record that’s a lot better than your memory. Most hotels have Wi-Fi. India was the only place where the service cost extra. The real question is what kind of device will you bring. Your smartphone may be enough if you don’t plan to do much writing. But we were both keeping blogs. (My companion's http://www.rtwin70days.com; Mine: http://www.marvels2014.blogspot.com). My companion brought a laptop computer. I left mine home in favor of a tablet. 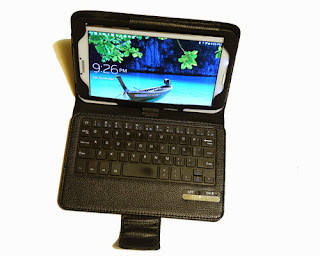 My choice was the 8-inch Samsung Galaxy Tab 3, for which you can buy a Bluetooth keyboard for $50 (widely available). It fit into my photo vest, easily into my backpack and is about one-quarter the weight of my laptop. This model has a micro-sd card slot, which I found very useful; iPads do not. Typing is not quite as smooth as on my laptop, but it was certainly doable. Of course, Tab 3 also has all of the versatility of a mobile device, not least of which is the onboard Kindle, which contained the guidebooks I downloaded for the countries we visited. The one disadvantage of the Tab 3 was that it would not enlarge the maps in these guidebooks, but all the hotels had free printed city maps. It has a very good photo gallery function, good email; I used it to write and upload my blog posts. 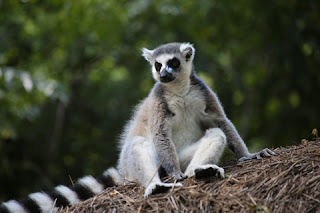 A ringtail lemur in the Parc National de l'Isalo in the Ihorombe region of Madagascar. It is one of the countries where smartphone calls are costly. Remember to bring enough power adapters. Incidentally, those heavy transformers are no longer necessary. All electronic devices these days accept both 220 and 120 current. It’s best to keep your adapters, battery chargers and cables together in a safe place. My T-Mobile phone worked in most countries for 20¢ per minute with free texting and Internet access. In some of the more remote countries I was off network, and the price went up to $4.99 per minute (Madagascar, Mongolia), so I switched it off. I could have bought a SIM card but didn’t bother. If you want good photographs bring a good camera. Do NOT rely on your smartphone. Your camera should have a good wide angle as well as telephoto capabilities – the 35mm equivalent of at least 18mm to 200mm or better. The maximum ISO should be at least 3200. If possible, select a camera that has no digital delay that can fire off several shots per second. This will be very useful when shooting from a moving vehicle. When doing so, set you ISO to at least 3200 and your shutter speed to at least 1/2000th of a second, shorter if possible. Always shoot in your highest resolution if you intend to keep your photos, and always in color. You can change to monochrome later. You may not need this much storage, but if you’re planning to be away more than two weeks, you can save on memory cards by having an easy-to-use portable hard drive like this one or a lower capacity one such as the Picture Porter 35. You can also see and sort your images on the Picture Porter models. The Samsung Galaxy Tab 3 is a lightweight and useful travel companion. Digital Foci also makes a portable power supply called a Battery Porter that comes in three models. Once you charge this device for several hours or overnight, you can charge your smartphone 4-7 times, or your tablet by 1-1.5 times. This is useful when you’re away from power sources or when someone else is using the car charger (if there is one). It’s also good to have some kind of camera support, even just a tabletop tripod or GorillaPod (http://www.joby.com/gorillapod). I use a lightweight, full-size Silk Sprint Pro II GM tripod with a quick-release ballhead when I’m traveling (http://www.bhphotovideo.com). It weighs a hair more than two pounds and extends to just under 64 inches – exactly the right formula. These are essential for night shooting. The 18.5-inch folded length fits conveniently into my suitcase. It also provided a rigid splint for my rolled-up Tibetan paintings (around a sturdy core). I don’t use flash very much, but it’s good to have for convivial group portraits and dimly lit interiors. You might also consider bringing a hand-held video light. These are quite versatile for illuminating details in frescos, for example, and they double as a great flashlight. 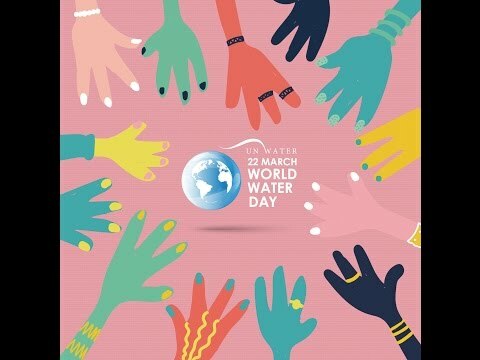 Many travelers will want to post their travel photos onto Web sites such as Instagram, Facebook, Pinterest and Picasa. It’s not as straightforward as it may seem, because if you’re serious about your photography, you’ll want to capture the images in high-resolution (printable), but upload them in low or web resolution without destroying the hi-res version for later printing. It’s easy to download anything onto a storage device such as the Picture Porter, but how can you downsize them to the resolution appropriate for the Web and still keep the high-res images? I’m still searching for an app for phones and tablets that downsizes images (there are several for computers). Perhaps we’ll see one come out soon. My own solution was based on my amazing Canon 5D Mark III. It is not a camera most people are likely to travel with. It has two card slots, one for an CF card and one for an SD card. I used a micro SD card with the adapter to record in the lowest resolution possible, while recording my hi-res images on the CF card. Then, I removed the micro SD card from the adapter and slipped it into my Samsung Tab 3 (the iPad doesn’t have this feature). 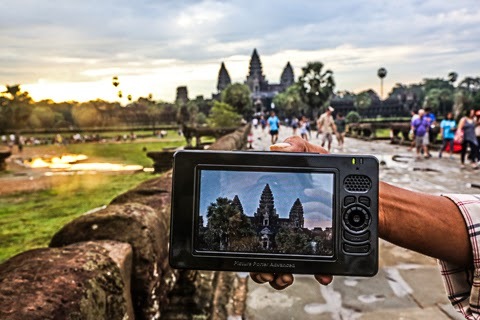 The Angkor Wat temple complex, a prime tourist attraction in Cambodia and the world's largest religious monument, viewed with an image of it taken earlier on thePicture Porter Advanced. Well, that should cover a lot of what you'll need to known for your own odyssey. Even if you choose only to jot down notes of what you saw, where you stayed, what you ate and whom you met, you’ll find you’ll treasure these memory for years and refer to them the next time the wild goose calls.